So now that I have Volo's guide in my grubby paws at last, I thought that it might be interesting to have a discussion in depth about each critter in chapter three. 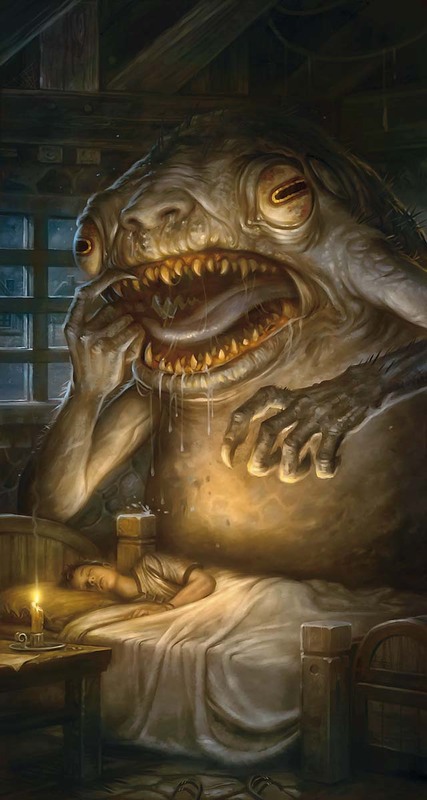 What you will find in this thread is a series of posts where I offer basic commentary on a monster entry in Volo's - plot ideas, how good the image is, how I'd use them in my game, what their combat routine is like, etc - and then various posters chime in with their own thoughts on the same. Usually their insights are more penetrating than my own! I've been posting one entry per day, so the discussion moves fairly quickly, and sometimes you will find that the conversation lingers on a different entry than the latest one, but that just rewards reading a bit longer. The focus here tends to be on fun storylines that you can tell with the monster, and how to use it in combat, but we do also have potted discussion of D&D history and how they have appeared in the adventures that Wizards have published. Anyway, welcome to the thread, and I hope that the discussion here is useful to you! Each entry below is a hyperlink to my post discussing the monster, and you will find others' comments about the same following. A list of all the Fey in the game can be found in this post, while the Gnoll Warband members are outlined here. Let's start with the Banderhobb. I've never seen these before, but I only really started D&Ding with any vigor this edition. They seem definitely to be there for a Hag storyline; the players meet and defeat this guy, and follow the trail back to the Hag. I'm envisaging him as a revenge tool, dispatched to cause carnage in a human village. One really interesting thing about the statline is the way that he gets a teleport & attack routine. Too many monsters in the MM have melee attacks and teleport, but cannot do them both on the same turn, leading to an oddly static combat; to get around this, I’ve used Legendary Actions for Teleport on monsters who don’t technically have it. However, Mr Banderhobb has this covered. However, the Banderhobb only gets the one big attack per turn, it seems. Makes him swingy, and also suggests that you’re really going to use Shadow Step or Swallow every turn if able. His HP also seems a bit low for CR 5, so I suspect again that he was designed to torment low level parties - teleporting around, hurting them, not necessarily lasting very long once they get a good view of him. Tongue-Pull a different PC into said trap or a hazard. PC's now have to help one PC out of a deathtrap, then track down a fleeing Banderhobb with a significant head-start. Eventually the Banderhobb will lead them to it's master, who may or may not be setting up a trap of their own. Banderhobb will hide in the shadows, doing hit-and-run disruption attacks, trying to pull more of the PC's into hazards. Hoping to grind them down via attrition. The actual picture in Volo's is also great, and I really like how the artist managed to make the face in both forms of the Barghest look faintly similar. I had a vague impression of these guys as fiendish dogs, and in Volo that is broadly true, however they are very tied into the Goblins. At CR 4 they are tough enough to be a true terror to the Gobbos, and I like the description of how a Goblin tribe that discovers one just goes into grovelling obedience to show how insignificant they are - very different from the responses to other 'hidden' monsters like the Frost Giant and whatnot. Using them in an adventure seems a little tough. You can have one just, you know, wandering around, but that doesn't make good use of their lore. I can imagine one turning up when the party attacks a goblin cave - using the confusion to massacre and consume the tribe's most prominent members - leading to an engaging 3-way combat. To be honest, I think that it'd be easiest to use them in a Goblins-as-PCs game. Let one of the Players actually be the Barghest, even. That could be a lot of fun. Otherwise, the fact that the Barghest tries to hide itself means that your party isn't going to see one deployed as part of a Goblinoid defense, but will instead find a Goblin to be a surprising threat. Good for springing on overconfident players, perhaps. The Yugoloth connection is a lot of fun though, and these guys are a solid addition to combats taking place against them, even if it means that you're not using most of the interesting elements of their lore. In terms of combat, they get one strong attack, but no multiattack routine; they are pretty damn tough though, with standard Yugoloth damage resistances, AC 17, and 90 HP. So that makes them more of a tank (a large, terrifying looking, tank) in terms of how they'll operate in combat. The Fire Banishment thing means that they're going to be victimised by medium level wizards casting Wall of Fire, but that sort of 'clever win' is often fun for the party, so I don't mind it. The Barghest comes with a bunch of spells, but they are mostly not ones that you'll see them use in combat against PCs I think. Suggestion is pretty good, but the rest not so much. They serve as a good explanation for how the Barghest can infiltrate Goblinoid encampments though, and provoke thoughts of a group of Player Character Goblinoids having to desperately hunt down a Barghest that is terrorising them - say, in an isolated, arctic facility? Finally, the Soul Feeding ability is one of those fun things in the game that helps to explain 'how things work', but is unlikely to actually come up that often. A bit like Mind Flayers and eating brains - if it happens, chances are that the party already lost the fight, and you're narrating the aftermath. It does have option as a plot hook, however; having an important NPC's soul trapped in the gullet of the Barghest could make for an interesting reason for your party to try and track it down in a local Goblin tribe's lair. One last thing about the Banderhobb - I googled it, and found this blog post by 'Steve' which discusses how he came up with it. Apparently this Steve worked on the 5e MM and DMG as well, but I'm failing to establish his last name from the blog. The Barghest is more suited for a long con than a single encounter. Two tribes of Goblinoids having been waging what amounts to a turf war in the countryside. One of them has been a constant thorn in the side of the local populace for years. This new group is outmaneuvering the old group, despite having far weaker numbers. On the surface, it seems like the leader of the new group, a Young Hobgoblin warlord who isn't too adverse to working with the locals instead of just exploiting or pillaging them, is some kind of tactical genius and a bit of a folk hero. In reality, the Hobgoblin is merely a magically influenced puppet of the Barghest, who is "serving" as a trusted left hand goblin for doing the dirty work. The Barghest has been using this warband as a way to put some of the more juicy targets on the menu, and deflect attention from it's existence. Once the Barghest finishes it's quest, it will open a portal to Gehenna, and who knows what will come out? The new warband may seek out the PCs as mercenaries, or perhaps the PCs seek out the warband as an ally against the old warband. Either way, it's a setup for the last two dishes on the Barghest's menu: The Old Warlord, and the New Warlord. Of interesting note, the Barghest is immune to poison, and has full access to any weapons it may have had tucked away while in it's goblin form. The setup, both Warlords are on the battlefield, facing off for the fate of their tribes. The PC's are backing one side or the other and after a pitched battle, are probably a bit worn down, and ready to burn through what is left of their daily resources to finish the fight. After one warlord falls, the Barghest pounces. (it's likely to survive to the end with little wear and tear due to it's resistances) Instructing it's most loyal of "followers" to unleash "The Mist" a heavy alchemical poison cloud that will obscure vision, cause poisoned status, and inflict damage to anyone caught in it's cloud for a just enough time to allow The Barghest to finish it's meal. The Barghest will then attempt to finish off the remaining warlord, and eat their bodies. Whatever remains of the warband will now turn on the PC's, drawing out the fight and perhaps setting up a flaming barricade to bar the PC's from entering the Mist to stop the ceremony (and maybe spilling the beans about what is going on to a particularly dense group). The PC's save the Hobgoblin, and gain an ally (and their army) for life. The PC's fail to save the Hobgoblin, but stop the Barghest from opening the portal. The warbands scatter, and cause general mayhem. The PC's fail totally, and the portal is opened. All hell breaks loose. If the PC's elect to banish the Barghest before it finishes it's meal, but after the hobgoblin is dead, it wont stop the ritual, as the Barghest was banished while holding the hobgoblins heart. Just enough to finish the consumption and open the portal from the other side. Interesting thoughts, Leatherhead! I like the idea of the players ending up with a tribe of bad guys that they can call on for help - great fun for the future, and gives them some interesting "working with the devil" roleplaying opportunities. You've also shown how the Barghest could be a really interesting element that totally turns a 'normal' Goblinoid situation on its head. It should be noted that Barghests are nasty evil creatures and can eat the souls of creatures other then Goblins to empower themselves, but they go back to Gehenna once they eat 17 goblin souls. Another way they could work is a barghest intimidates a goblin tribe into serving it then using it's army to trap other humanoids to eat them while eating the most adept goblins in the tribe every once in a while. This way they will be even stronger when they return to Gehenna. Another day, another monster: this time we move onto the Beholderkin, with the Death Kiss. There are three new Beholderkin in Volo's (technically four, if you fancy including the Mindwitness) added to the Spectator and Beholder in the main Monster Manual. The Power Score chap has a blog post discussing all of the Beholderkin here. The art in Volo's is surprisingly... cute. It looks like the Death Kiss is a blushing bride-to-be. I fear for the safety of the groom, however! These busters are pretty interesting. Their writeup makes it clear that they can either be encountered individually or as lackeys of Beholders. The latter makes sense - it is a way to have a tough pre-boss fight in a Beholder's Lair, or to accompany the Beholder itself to avoid Banishment ruining your boss fight. Meanwhile, encountering them individually seems like a solid 'on the road' kind of encounter, perhaps in a cavern that the Death Kiss has claimed as its own. Being a vampiric aberration, there is some really strong horror potential here, and you could probably creep your players out something fierce with it. The Death Kiss also has a middling intelligence, and the ability to speak. That gives it some potential for a bad guy to chat to; the party might find the Death Kiss whispering gently about them as it stalks them (admittedly, with its nonexistent Stealth score...) through its cavern. Who knows. I don't get the impression that this guy is much of a schemer, but he is a cross between a Vampire and a Beholder, both top tier boss monsters. As ever, I'd be tempted to transpose this guy into a city, to see how it goes there - no Sunlight Sensitivity here. "Where are all the homeless people? ", "Well, the Guard keep dragging them off to that warehouse there..." will let you totally surprise the party by giving them this lad instead of a common or garden variety Vampire, once they break into said warehouse. As to its stats, the Death Kiss works like other 'grappling monsters', such as the Roper. It grabs people, then does unpleasant things to them. Unlike the Roper, you cannot cut the individual arms off, however. There is real potential for a TPK level fight with this guy, I think, if he happens to have a good first turn (grappling three important party members) and can start healing on his second turn while doing loads of damage. However, it really isn't that hard to escape the grapple checks, so you'll likely want to aim at the squishies first, and be prepared to answer questions like "How can my fighter help the wizard escape the grapple?" I've found with that sort of question - similar to "can I close my eyes against a Medusa?" - that it can be easier and quicker to just tell the players how the rules work for it upfront, as otherwise you'll have to explain them repeatedly during the combat. The Death Kiss also has a melee damage return thing, Lightning Blood, which doesn't seem like a big deal. However, I nearly had a TPK when my party (who relied on a Monk and a melee Fighter to do damage) went up against some Fire Elementals, and the Monk was taking more damage than he was doing per hit. To this day, they despise all Fire Elementals! At CR 10, it is less likely that the Death Kiss will cause that problem, but it is still a funny one to consider. Volo's Guide to Monsters - Which monsters do you want to see? Volo's Guide: "You might be wondering why certain monsters were chosen above others... We hope to tackle other monsters in other products over time."